Click here for estimate via email! Directly Anytime From Your Mobile! You've tried the other moving companies now try the best moving company! and storage tips available by calling us! Amesbury MA, Andover MA, Arlington MA, Berkley MA, Beverly MA, Billerica MA, Boston MA, Boxford MA, Bradford MA, Brighton MA, Brockton MA, Brookline MA, Burlington MA, Byfield MA, Cambridge MA, Carlisle MA, Charlestown MA, Chelmsford MA, Chelsea MA, Chestnut Hill MA, Concord MA, Danvers MA, Dedham MA, Dracut MA, Essex MA, Everett MA, Georgetown MA, Gloucester MA, Groveland MA, Hamilton MA, Hanover MA, Haverhill MA, Holliston MA, Hyde Park MA, Ipswich MA, Jamaica Plain MA, Lawrence MA, Littleton MA, Lowell MA, Lynn MA, Lynnfield MA, Malden MA, Manchester-by-the-Sea MA, Marblehead MA, Marlborough MA, Mattapan MA, Medford MA, Melrose MA, Merrimac MA, Methuen MA, Middleton MA, Nahant MA, Newbury MA, Newburyport MA, Newton Highlands MA, Newton MA, North Andover MA, North Reading MA, Peabody MA, Quincy MA, Randolph MA, Reading MA, Revere MA, Rockport MA, Roslindale MA, Rowley MA, Salem MA, Salisbury MA, Salisbury Beach MA, Saugus MA, Somerville MA, South Hamilton MA, Stoneham MA, Swampscott MA, Tewksbury MA, Topsfield MA, Upton MA, Waban MA, Wakefield MA, Waltham MA, Watertown MA, Wayland MA, Wenham MA, West Boxford MA, West Newbury MA, Wilmington MA, Winchester MA, Winthrop MA, Woburn MA, Worcester MA and many, many more! Atkinson NH, Chester NH, Concord NH, Danville NH, Derry NH, Dover NH, East Hampstead NH, East Kingston NH, Epping NH, Exeter NH, Fremont NH, Greenland NH, Hampstead NH, Hampton NH, Hampton Beach NH, Hampton Falls NH, Hudson NH, Kingston NH, Londonderry NH, Pelham NH, Plaistow NH, Manchester NH, Newton NH, North Hampton NH, Raymond NH, Rye NH, Salem NH, Sandown NH, Seabrook NH, Somersworth NH, South Hampton NH, Stratham NH, Windham NH and many, many more! 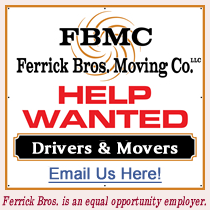 Serving All Of New England, N.Y., N.J.
Ferrick Bros. Moving Company, L.L.C.